If The Bills Don’t Take a QB at 12, Who Is Their Guy? Around the National Football League, almost everyone feels the Buffalo Bills will try and move up from the 12 slot to select a quarterback in the first round. There is also word around the League that the Bills are eyeballing just one particular quarterback and if he is gone they will stay a 12. If that is the case, who could be the player the Bills would love to take with that pick? If you listened to Head Coach Sean McDermott talk at the league meetings earlier this week, you heard him say that beside quarterback, the one position the Bills have to get right is the middle linebacker position. 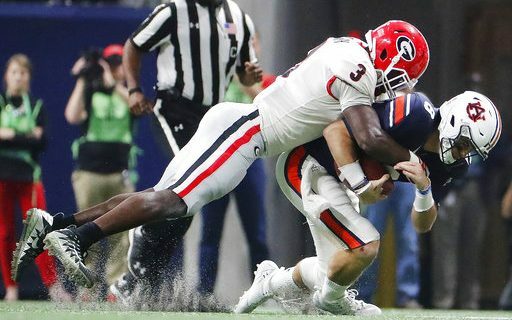 Using the Carolina Panthers linebacker corps as an example of what McDermott wants at the position, then only one player comes to mind that early in the Draft; Georgia’s Roquon Smith. Smith is very similar to the Panthers Luke Kuechly is terms of instincts and style of play. Smith, at 6’1 – 236, is a little smaller than Kuechly but with his 4.51 40 speed he is faster. Smith is an instinctive playmaking machine. In 2017 he had 124 total tackles, 13.5 tackles for loss and 5.5 sacks. He makes plays versus both the inside and outside run, gets rid of blockers quickly, and is a tenacious tackler. With his speed, his range to the sideline is second to none. In the two College Football Playoff games he made dominating plays. Without question he is the leader of the Bulldog defense, calls the defensive signals and is very vocal on the field. Smith is very good in pass coverage. He has the speed, quickness and athleticism to matchup against backs and tight ends and is equally proficient in man and zone coverage. When used in blitz schemes, he comes hard and can either elude or go through blocks. Other than having a bit less than ideal size, I don’t see any real weak points in Smiths game. In the Bills defensive scheme he is the ideal Mike linebacker and having him in the game will make the defense that much better. Other scouts may have Virginia Tech’s Tremaine Edmunds as the top inside linebacker. It’s my opinion that Smith is a bit ahead of Edmunds and mainly because Smith has far superior instincts. I also feel that Edmunds is a better fit for a 3-4 scheme than a 4-3. If the Bills do end up taking a quarterback with that first pick, there are two other linebackers in this draft that the Bills may be able to get with their second first round pick. Those two players are Boise’s Leighton Vander Esch and Alabama’s Rashaan Evans.